At the 2015 Geneva Motor Show curtains uncovered the Optima’s new design. 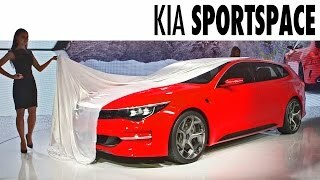 The Four door Kia Sportspace 2015 Concept hints that the Korean manufacturer has all plans set to expand the Optima’ queue in near future. 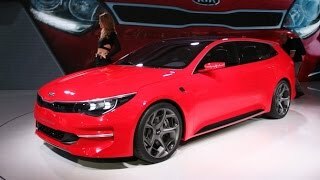 Previewed by a teaser photo the 2015 Kia Concept of this mid-size sedan gives you several reasons to conceptualize, as to how it might look. Let us see what all the company shared. The Interior knocks the doors with styling approach. Let us begin with the dashboard; it comes with the angular lines and a clean layout. Company has removed the center stack with a large touch screen. Following the same pattern Kia also worked upon the cluster boasts integrated navigation and more of linked features. A tall console between the front seats unit various buttons, switches and gear shift lever, each of them encapsulated in a carbon fiber frame. The same light weight material is also used in the front seat frames and the door panels showcasing cleaner design. With these joins the black leather seats with matching stitching giving a neat and formal look to the cabin. Apart from a few buttons and a little upscale appearance the flat-bottom steering will remind you of current Optima. On the whole the Kia’s concept previews next-gen interiors for mid and full-size cars. Although we for the moment cannot define the actual luggage space offered but you can be sure that the interior will avail you comfort and substantial practical load space. The Bold and dynamic exterior design hold its roots in the 2015 model year sedan with its certain features like, the ‘tiger nose’ front grille, headlamps, hood and bumpers. The exterior looks hints you that Kia is somewhere in a mood to develop a wagon version of its midsize sedan. As we mentioned earlier the Kia’s trademark grille has been replaced by the ‘tiger nose’ affixed in its front fascia. The headlamps are revised with a crispier and sportier shape. Giving the exterior both decent and sporty looks. The turn signals are separated from the headlights through LED accent stripes; this indeed gives the front a unique appearance. Around back you’ll find squinty taillights, though we personally believe that the rear main essence falls in the leap of its bumpers. Unlike the present Optima the apron area is downright massive and mimics a diffuser. However we aren’t sure about the material used, it might be carbon-fiber or could even be faux but in whole it is unique and intriguing, and to add more in it the exhaust outlets and main vents portray the same shape. Inspite of being identical to an extent the profile holds its newer revised blend, might be because the Kia Sportspace Concept 2015 is a wagon. 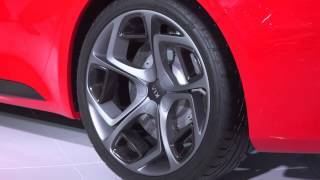 It has eye-engaging five-spoke wheel design, which for one will instantly make you remember the Alfa Romeo 159 Sportwagon. With its unique, intriguing features, Kio Sportspace from my part is expected to be a sensation once the concept gets into the assembly line. As of now the Kia didn’t share any of the statistics but inside a thought knocks that it might hold turbocharged 2.0 liter, in-line four engine, which produces 274 hp and 365 nm of torque. Talking about the competition for 2015 Kia Sportspace, I believe it might have to battle its existence in wagon market from the Mazda 6 Wagon. Apart from these there is no information shared by the company as of now, we might expect to have the same once they find their concept practical enough to land the market.